Bobcat Australia extends its line of compact track loaders with the introduction of the radius lift-path T140, which has a rated operating capacity (ROC) of 635 Kg, width of 1,397 mm. and length of just 3,150 mm. with bucket making it the smallest track loader in Bobcat Australia's range. The Bobcat T140 complements the other track loaders already manufactured by the Bobcat Company. 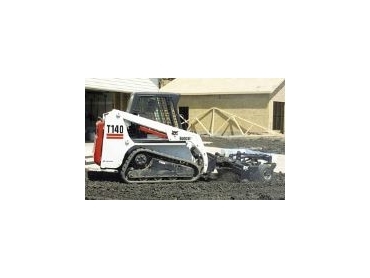 This compact track loader will appeal to the construction industry in particular because of its compact size and superior ability to work in difficult ground conditions making it ideal for contractors looking for optimal power in a compact, tough, and agile machine with great manoeuvrability for tight conditions. The Bobcat T140 provide customers with impressive performance in a machine that enables contractors to work more productively in mud, sand, or other soft ground conditions. The rubber-track undercarriage also provides improved traction and better flotation with minimal ground disturbance, even in soft, wet, or muddy conditions. The Bobcat T140 has a turf-friendly lug track that distributes the operating weight of the 2,920 kg. loader over a larger area, resulting in a 34,5 kPa ground pressure. The low ground pressure minimises damage to landscapes, paving stones, other established surfaces and the tracks themselves. The T140 offers 64 L/Min of auxiliary hydraulic flow and is powered by a liquid-cooled, 34 kW diesel engine. More than 40 different Bobcat-brand attachments are approved for the new model, including the landscape rake, soil conditioner, and combination bucket. Also the T140 has industry-leading features, such as fingertip auxiliary hydraulic controls, automatic engine/hydraulic shutdown, the Bobcat Interlock Control System™ (BICS), Dual Path Cooling System, Bob-Tach attachment mounting system, and a deluxe operator cab. For more information, model specifications or your nearest Bobcat equipment dealer contact Bobcat Australia on 1800 643 853 or visit www.bobcat.com.au.